The MK Fencing Academy International Epee Cup is the most prominent annual event in UAE dedicated to the noble Olympic sport of fencing. It takes place every December, attracting over 200 fencers from more than 40 nations from around the world. It is held under the patronage of the Dubai Sports Council, UAE Fencing Federation and MK Fencing Academy by Super Sports Academy LLC. 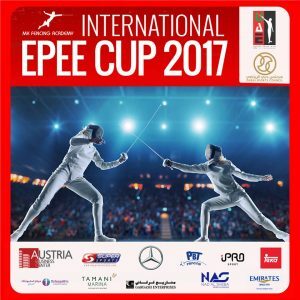 Invitation: MK Fencing Academy International Epee Cup – Postponed to 2019!!! From vision to reality, the 6th MK Fencing Academy International Epe Cup 2017 has proved that dreams do come true! What started 6 years ago, as a small competition with a big spirit, today has become the UAE leading sporting event of the year for all fencing fans! Top fencers from around the world, amongst which Niokolai Novosjolov two times World Champion and the Olympic silver medalist Ana-Maria Popescu will show their invincible skills and mastership of the sword in the international tournament, which took place on 15th and 16th of December 2017 in Dubai. The exclusive event has been founded and led by MK Fencing Academy in partnership with Dubai Sports Council and UAE Fencing Federation and with the support of Gargash Enterprises as well as Austrian Business Center, TEKA, Osteopathic Health Center Dubai, Super Sports Academy and PBT Fencing. If you have any questions please don’t hesitate to contact us on fence@mkfencingacademy.com.